The 2005 UEFA Champions League Final was the final match of the 2004-05 UEFA Champions League, Europe's primary club football competition. The show-piece event was contested between Liverpool of England and Milan of Italy at the Atatürk Stadium in Istanbul, Turkey on Wednesday 25 May 2005. Liverpool, who had won the competition four times, were appearing in their sixth final, and their first since the Heysel Stadium Disaster in 1985. Milan, who had won the competition six times, were appearing in their second final in three years and tenth overall. Each club needed to progress through the group stage and knockout rounds to reach the final, playing 12 matches in total. 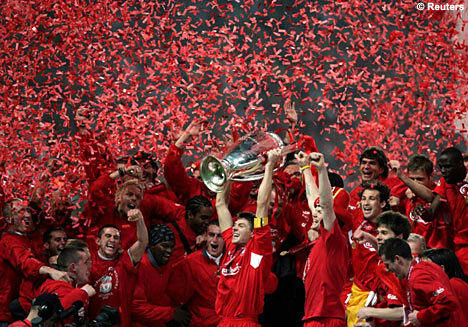 Liverpool finished second in their group behind 2004 runners up Monaco and subsequently beat Bayer Leverkusen, Juventus and Chelsea to progress to the final. Milan won their group ahead of Barcelona and faced Manchester United, Internazionale and PSV Eindhoven before reaching the final. Milan were regarded as favourites before the match and took the lead within the first minute through captain Paolo Maldini. Hernán Crespo added two more goals before half-time to make it 3-0. During the second half, in a stunning comeback, Liverpool scored three goals in six minutes to level the scores at 3-3, the goals coming courtesy of Steven Gerrard, Vladimír Šmicer and Xabi Alonso. The scores remained the same during extra time, and a penalty shootout was required to decide the champions. The score was 3-2 to Liverpool when Andriy Shevchenko's penalty was saved by Liverpool goalkeeper Jerzy Dudek. Thus Liverpool had won their fifth European Cup, 20 years after being banned from European competition following the Heysel Stadium Disaster. 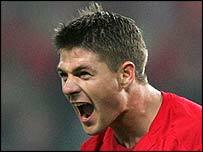 The match is often referred to as the "Miracle of Istanbul".